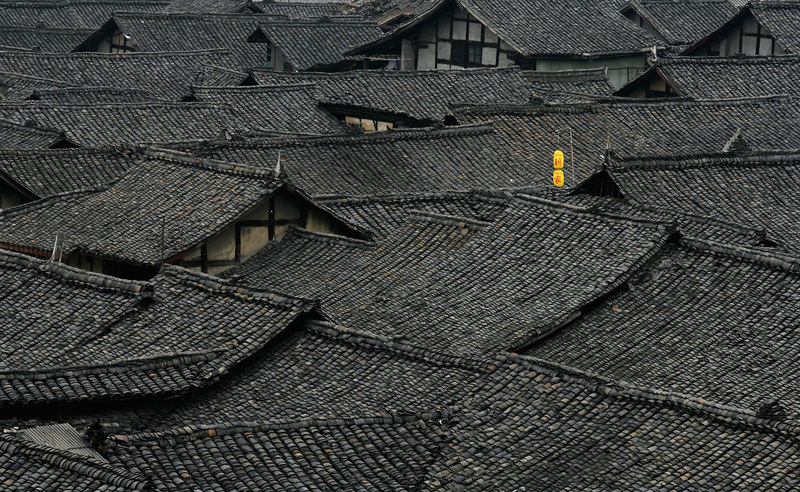 Langzhong, Sichuan province, an ancient city established during the Qin dynasty, some 2,300 years ago. This article was first published in the April 21, 2016 issue of The New York Review of Books. State University of New York Press, 372 pp. As Beijing prepared to host the 2008 Olympics, a small drama was unfolding in Hong Kong. Two years earlier, middlemen had come into possession of a batch of waterlogged manuscripts that had been unearthed by tomb robbers in south-central China. The documents had been smuggled to Hong Kong and were lying in a vault, waiting for a buyer. University administrators acted boldly. They appointed China’s most famous historian, 75-year-old Li Xueqin, to head a team of experts to study the strips. On July 17, the researchers gingerly placed the slips in enamel basins filled with water, hoping to duplicate the environment that had allowed the fibrous material to survive so long. Until now, this revolution has largely been confined to paleography—the deciphering of ancient texts. But its importance is slowly spilling into other disciplines, as a result of the deciphering of the Tsinghua bamboo slips now at Tsinghua University, and several other excavations made in the past two decades. Although their significance is not widely understood in the West, in China they have already aroused popular interest, with newspapers and television reporting as these texts are edited and published.1 And yet the implications of these unearthed texts are so profound that they will take decades to digest. The newly discovered texts challenge long-held certainties about this era. Chinese political thought as exemplified by Confucius allowed for meritocracy among officials, eventually leading to the famous examination system on which China’s imperial bureaucracy was founded. But the texts show that some philosophers believed that rulers should also be chosen on merit, not birth—radically different from the hereditary dynasties that came to dominate Chinese history. The texts also show a world in which magic and divination, even in the supposedly secular world of Confucius, played a much larger part than has been realized. And instead of an age in which sages neatly espoused discrete schools of philosophy, we now see a more fluid, dynamic world of vigorously competing views—the sort of robust exchange of ideas rarely prominent in subsequent eras. These competing ideas were lost after China was unified in 221 BCE under the Qin, China’s first dynasty. In one of the most traumatic episodes from China’s past, the first Qin emperor tried to stamp out ideological nonconformity by burning books. Modern historians question how many books really were burned. (More works probably were lost to imperial editing projects that recopied the bamboo texts onto newer technologies like silk and, later, paper in a newly standardized form of Chinese writing.) But the fact is that for over two millennia all our knowledge of China’s great philosophical schools was limited to texts revised after the Qin unification. Earlier versions and competing ideas were lost—until now. When China’s imperial system collapsed in the early twentieth century, iconoclasts used the lack of ancient texts to question everything about China’s past. Led by one of China’s most influential historians of the twentieth century, Gu Jiegang, this “doubt antiquity” (yigu) movement cast aspersions on the received history that Chinese had learned for millennia, from the existence of its first dynasties to the uniformity of the great philosophical texts.3 For Gu Jiegang and his allies, Chinese history was much like the West’s, founded in myth and oral traditions that only slowly evolved into written works at a much later date. These were plausible theses, but Gu had no archaeological evidence to back his ideas, instead relying on close readings of the transmitted texts to find inconsistencies. The discovery of ancient texts has begun a challenge to these simplistic positions. In 1993, tomb robbers were thwarted in the village of Guodian, in central China’s Hubei province. Archaeologists stepped in and found eight hundred bamboo slips. The next year, 1,200 slips were smuggled to Hong Kong and bought by the Shanghai Museum. The Tsinghua strips followed in 2008, numbering nearly two thousand full slips (the final number is in flux as fragments are being pieced together). All three finds likely came from the same region of China near the Yangtze that used to be occupied by the state of Chu. Carbon dating shows that all three were buried around 300 BCE, right around the time that Confucius’s chief disciple, Mencius, died. These are not China’s oldest writings. Chinese characters first appeared on “oracle bones”—tortoise shells that were used for divination, mainly in the Shang dynasty (circa 1600–1050 BCE). They are useful for understanding that era, but the core texts of Chinese civilization came later. They were written on bamboo or wood strips that could be bound with string and rolled up, allowing for the creation of complex works of legend, philosophy, and history. Academics in China have responded with thousands of books and articles, discussing every detail of the new texts. Western scholars have joined in a bit more slowly. But, perhaps with the benefit of distance, they are drawing broader and more provocative conclusions.5 One example is The Bamboo Texts of Guodian, an epic, 1,200-page annotation and translation of all eight hundred slips from Guodian by Scott Cook of Yale-NUS College in Singapore.6 This is the most complete rendering of the Guodian discovery in any language, including Chinese, and is an example of the sort of cross-cultural work now possible among paleographers who share their ideas and views on blogs and in chat rooms. Most notable among the Guodian texts is a version of the Daoist classic, Laozi’s Daodejing (better known in the West by the older Romanization form as Lao-tzu’s Tao Te Ching, or “The Way and Its Power”). Cook writes that the discoveries at least partly confirm traditional views of the antiquity of the Daodejing, a hotly debated subject for the past century, especially in the West. This is because antiquity doubters like Gu influenced many of the West’s most important sinologists of the twentieth century. In his highly influential 1963 Penguin translation of the Daodejing, for example, D.C. Lau arbitrarily adds 196 subheadings to the text, arguing that these were independent sayings with only a “tenuous” connection to each other, and were only collected much later, and in a haphazard manner. The newly excavated texts, however, show that at least large chunks of the Daodejing were circulating in China in the Warring States Period. Some Chinese scholars like Cook and Li believe that the full text existed at that point. But the most revolutionary implications of these texts are political. In her 1981 book The Heir and the Sage, the Dartmouth paleographer Sarah Allan presciently described the central part that abdication played in ancient Chinese thought. As elsewhere in the world at this time, philosophers were grappling with the best way to organize and lead states. Should one be loyal to one’s family (and thus support hereditary rule) or should one put the best interests of the state (and the people) first, and accept that the best person should run the land? One school of Chinese thought, Mohism, advocated meritocracy in the appointment of officials, while other schools referred to ancient kings who handed rule to sagacious ministers rather than their sons. These legends of abdication were also incorporated in the work of Mencius. He accepted hereditary rule, but with the caveat that if a ruler was very bad, then the people could abandon him and the “mandate of heaven” could pass to a better ruler. But overall the transmitted texts support hereditary rule; revolt was meant to be a measure of last resort to depose a tyrant or a grossly incompetent ruler. Abdication was consigned to the primordial past. The new texts reveal that other philosophers took much more radical positions. Some contend that every ruler eventually should abdicate in favor of the most talented person in the land. And not just that, but at least one of the new texts is explicitly Confucian in origin, forcing us to revise our view of that school of thought. Sarah Allan makes the case for this in her bold new book, Buried Ideas: Legends of Abdication and Ideal Government in Early Chinese Bamboo-Slip Manuscripts. This is a translation of four texts, all previously unknown, all firmly in the intellectual world of the followers of Confucius, but all arguing strenuously in favor of meritocracy—even for rulers. The other text from Shanghai, the Rongchengshi, is a long narrative describing an idealized time when all served according to their ability, not according to their birth. The final text, the Bao Xun from the Tsinghua collection, is an instruction from a king to his son, reminding him that abdication is a high ideal. served to promote abdication as an alternative to hereditary rule. This paradigm of abdication is the only alternative to the idea of dynastic cycle found in the Chinese tradition and it did not survive the Qin and Han dynasties as an idea for an alternative form of succession. Do these old texts matter today? They do in several ways. One has to do with the antiquity of China’s written culture. In the West, many classic texts, for example by Homer or stories in the Bible, are widely accepted as having been oral works that later were written down—a view of history picked up by Gu and the antiquity-doubters of the early twentieth century. Even though Gu was sidelined in China, his heirs in the West have tended to dismiss traditional views that important works in China were written down early on, or even composed as written texts. For many of these skeptical Westerners, Chinese efforts to prove the antiquity of their culture is closet chauvinism, or part of a project to glorify the Chinese state by exaggerating the antiquity of Chinese civilization. But the new discoveries should give pause to this skepticism. Allan argues that the texts were indeed primarily written down, and not transcribed oral tales. Besides the Daodejing, only a few of the texts excavated over the past 20 years have mnemonic devices or rhyme. She writes that even the texts that claim to be speeches of ancient kings originated as literary compositions. And as the Guodian texts show, works like the Daodejing took a written form earlier than skeptics believed, possibly even as early as the traditionalists have always claimed. Another point of contention is the scope of ancient Chinese civilization. In traditional history, China was seen as stretching from Beijing in the north to Guangdong in the south, and from its coastline to today’s Sichuan province. Some Westerners have dismissed this, saying that it did not make sense to speak of “China” before the Qin unified China in the third century BCE. Instead, they argue, the states that existed before the Qin should be viewed as separate cultures. But the discovery of these manuscripts at least partially backs the traditionalists. They are almost certainly from the southern state of Chu, which had one of the most distinctive local cultures. The implication is that the various kingdoms engaged in the same philosophical debates and discussions, perhaps making it defensible to speak of one greater cultural area. And yet the texts also challenge the traditionalists. Even today, Mencius’ “mandate of heaven” is essentially the argument used by the Communist Party to justify its rule: the Kuomintang had become corrupt and ineffective, thus the Communists were justified in usurping power. The Party’s continued rule is likewise justified by China’s economic development, which proves heaven’s support (“history’s judgment,” in Communist parlance). But true to Chinese tradition, the Party makes clear that its rule is hereditary. This is true not only broadly in the sense that other parties cannot take power, but narrowly in the creation of a quasi-hereditary class that has coalesced around “red” families that helped found the Communist state. The old texts, however, show that even in ancient China, a significant group of writers disapproved of such practices, arguing for rule based purely on merit rather than membership in a group. Without viewing the past too much through today’s lens, one can also see other intriguing parallels to contemporary society. Back in the Warring States Period, rising literacy and urbanization gave rise to a class of gentlemen scholars, or shi, who advised kings; some thought that they might be better qualified than the person born to the throne—the origins of the meritocracy argument. Today, similar trends are at work, but on a much broader scale. Now, instead of a scholar class that wants a say, it is the entire population. One might even say that the excavated texts show a more freewheeling society than today’s. Here we encounter a past that was home to vigorous debates—a place where Confucians approved of kings abdicating, and might even have fancied themselves capable of ruling. Today’s China also has such ideas, but like the bamboo slips before their discovery, they are buried and their excavation taboo. The main offices of China’s National Archives are located just north of the Forbidden City in a small campus of 1950s-era buildings. This was a brief period when the new People’s Republic was trying to develop its own architectural style, and several famous architects came up with a hybrid form: the main structure made of brick, not wood, allowing it to be much bigger and higher, but the roofs tiled and the eaves curved. At the time, many condemned the style as a pastiche, but these are among the few buildings in the capital that bridge the past with the present. I went there in 2014 to hear a public talk by Liu Guozhong, one of Professor Li’s chief deputies. Almost every year, the team gives a public update on its work. As one of the younger and more dynamic members, the task often falls to him. A southerner with a heavy Hunan accent, Professor Liu is humorous and engaging, and spoke for 90 minutes without notes. Liu told a crowd of about one hundred the story of how he and other members of the team saved the strips from rot in 2008. He showed pictures of how the strips were now being held in trays in a dark room and how the university was building a museum and research center. Then he outlined some of the new texts soon to be released: a chart for multiplying and dividing complex numbers, as well as new books of divination. Liu spoke carefully and avoided grand conclusions. In person at their offices or at international conferences that they organized, team members speak freely, but their writings and comments are focused on very specific issues. At one conference, I sat next to Sarah Allan, who noticed the same thing. At his lecture, Professor Liu said the work will keep him busy until he returns, adding: “But then you and others will be debating this for the rest of this century.” He then concluded and bowed to the audience. People rushed the stage, peppering the young academic with questions. There was a man from the I Ching Research Society asking how they should treat the new texts on divination. A journalist asked about a chart that could be used as a calculator. A graduate student from Peking University eagerly asked about the political implications of abdication. Professor Liu answered them all, while handing out name cards. When the last of his stack was gone, people began to pass them around, snapping photos of his card with cell phones. The room was lit now only by the dim winter sun. The guards at the back waited to lock the door, but the crowd wouldn’t let Professor Liu leave. For them, he held a key to the present: the past.